Hired the large bouncy castle with the slide on the side for my daughters 4th birthday today and it was a massive hit! The kids were never off it! Great service, Thankyou Paul! Had an amazing service from Paul and his team today at our school summer Fayre, nothing was too much trouble and he even popped back to move it further into the shade for us. I can highly recommend them and will definitely be using them again for our next event. Fab service, quick and professional, delivered and picked up swiftly and great value for money. Would highly recommend. We hired the 50ft assault course for our daughters birthday party! It was amazing! Paul was easy to deal with and super efficient! Thanks so much! This small castle will fit in most gardens comfortably. It’s suitable for children only and is very popular for birthday parties and fun days! We also ?have a larger version of this castle available for hire. The bouncy castle blowers should go directly into a standard ?plug socket, usually from the house or garage. We will bring extension cables if needed, but these can't be used for distances over 50m. If there is no nearby source of power, we can supply a generator or petrol blower at an additional cost. You can add ones of these on to your order when filling out the booking form, or give us a call/email if you are unsure. Please make sure the surface is reasonably flat with no loose stones nearby, as these can damage the castle. This is the smaller version of our Red & Yellow bouncy castle. 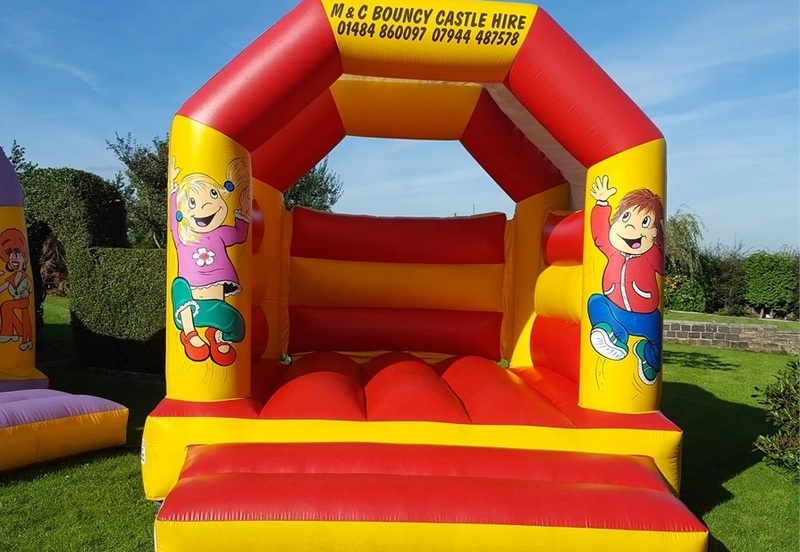 If you would like to view the larger version you can click on the following link (Red & Yellow Kids Party Bouncy Castle (12 x 14)). Both of these castles can be set up indoors, as long as there is enough room. If unsure, please get in touch via the email form on this page, or call us on 07944 487 578. If it starts raining while using the inflatable, we ask that you first cover any plug sockets with plastic bags. If it is only a light shower, it is better to leave the castle inflated so the water can run off quickly. The shower cover should provide enough protection against light rain. If the rain becomes very heavy, you may want to switch the castle off and let it deflate. Putting a waterproof ground sheet over the deflated castle will stop the water getting in, and allow you to use it as soon as the rain stops. If the castle has become wet, you may need to leave it for a while to dry out, before drying off any excess water with an old towel. Make sure to dry the step, as this can become slippery.